Two new banners were hung last week inside the Lindle Castle Gymnasium, and on Saturday night, during the Robbie Davis Memorial Classic basketball event, the subject of those banners were honored. The Clinton County Volley Dawgs were called to the center of the hardwood and the new banners featuring their accolades were pointed out. 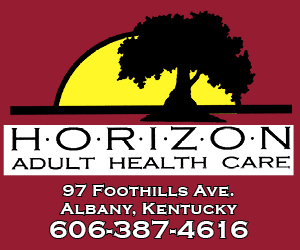 During the past two seasons, the team has earned a two-year record of 43 wins against 21 losses, winning back to back 16th District Champion titles as well as back to back 4th Region All “A” Champions titles. 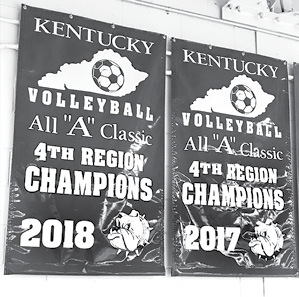 During the 2018 All “A” State Tournament run, they made it to the final eight in the gold bracket and the final four of the KHSAA 4th Region Tournament, eventually losing to the 4th Region Tournament Champions, Greenwood High School. To date, all of these accomplishments are Clinton County High School Volley Dawg records.